3 Bedroom Detached House For Sale in St. Ives for Guide Price £500,000. The rare chance to purchase one of the most recognisable properties within St Ives. The Roundhouse really must be viewed to be fully appreciated. 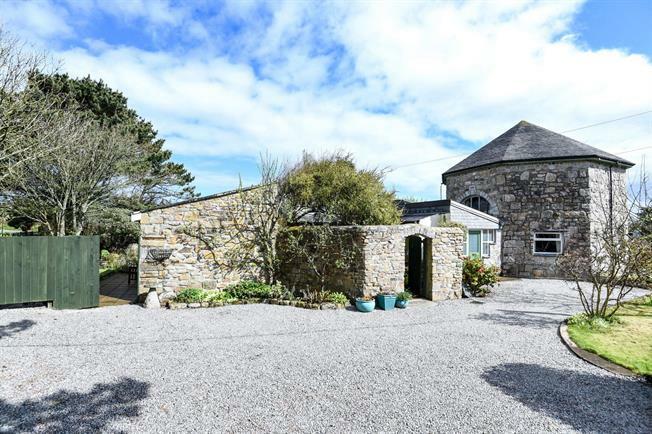 This home sits in wonderful, mature, large and well tended gardens bordering onto the iconic Consols Pool with a small stream running through them. The property itself offers unique accommodation and presents 3 bedrooms (master en-suite) kitchen diner and an individual sitting room on the first floor in an Octagonal shape with large floor to ceiling windows. There is ample off road parking and a detached garage / workshop. The Roundhouse is located just 1 mile outside the famous harbour town of St Ives. In recent years, Carbis Bay has been named as one of the worlds 20 most beautiful bays and sits between the harbour town of St Ives and the sandy Hayle Estuary. Home to the famed Tate St Ives Gallery and the famous Barbara Hepworth Museum, St Ives is bordered by three beautiful sandy beaches which are repeatedly voted among the best in the British Isles, one particularly for surfing. Set against the colourful backdrop of the working fishing harbour, the turquoise waters of St Ives have attracted artists since the 19th century due to its renowned clarity of northern light. The town, with winding cobbled streets, is also a 'foodie' destination packed with numerous restaurants, pubs and cafes all offering excellent fare. Indeed, the highly acclaimed and award-winning Porthminster Café is just a short walk from the town itself. At nearby Lelant, overlooking the Hayle Estuary there is a spectacular Links golf course with views stretching up towards Godrevy Lighthouse. A scenic branch railway line links Carbis Bay and St Ives with the main London-Penzance line at nearby St Erth. The following services are available mains electric, mains gas, metered mains water, mains drainage and telephone line is connected (however we have not verified connection). Combination boiler providing both the hot water and central heating via radiators on both the ground and first floor levels. Heading west on the A30 turning right at the roundabout signed for St Ives. Head straight over the first mini round about then at the following roundabout turn left signed for Nancledra and the 'Brown' sign saying Tate St Ives Tate and St Ives Day Visitors. Follow this road till you reach the 'T' junction. Turn right which will be the B3311. Follow without deviation to the next 'T' junction where you will turn left, where it will be signed for St Just/Morvah. You will spot the property immediately in front of you indicated by our Country & Waterside Prestige For Sale Board.